German teenagers are shunning traditional TV programs and news casts in favor of online content on platforms such as YouTube. With this in mind MESH Collective launched two news shows, „Brainfed“ and „TenseInforms“ in July 2014, aimed at and produced especially for the “generation YouTube”. Both shows are produced with the support of the German Federal Agency for Civic Education. These formats focus on a young audience, such as teenagers and young adults. While established broadcasting services are struggling to connect to young viewers, MESHs two news shows successfully manage to cover the difficult topics when it comes to younger target groups, such as current events or political updates. A fair mix of background knowledge, facts, current news updates, a focus on youngster-related topics, journalistic research as well as a YouTube-suitable look and adress of the viewer, seems to be the trick behind BrainFeds and TenseInforms success – both shows currently being the only editorially curated news shows within the German YouTube scene on YouTube. The idea is to generate news with a high relevance for a young target group. „BrainFed“ is Germany’s first (and currently only) animated news show on YouTube and is co-produced with the german YouTuber (and channel) DarkViktory. 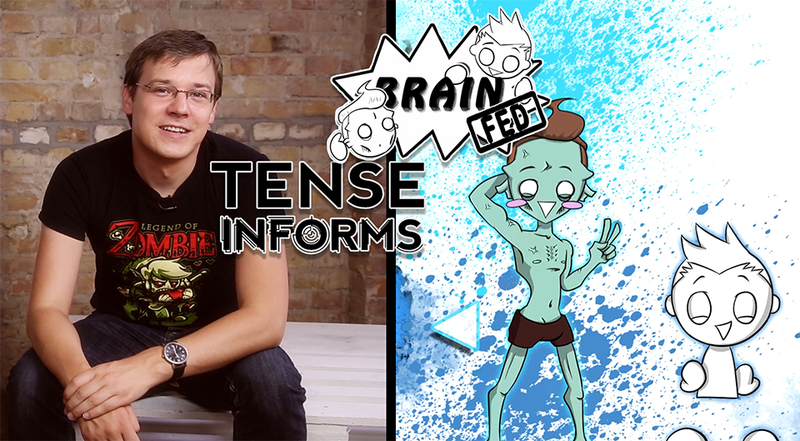 „TenseInforms“ in comparison is a VLog-Style format, produced with the YouTuber Tense for his educational channel TenseMakesSense. Up to date both news shows have generated more than 4.5 mio views, they have produced and supported multiple successful hashtag campaigns as well as setting their own specific topics inside the german YouTube scene.